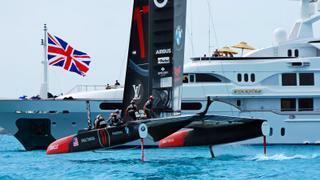 The much-anticipated 35th America's Cup kicked off on May 27 in Bermuda and hundreds of people have flocked to this tiny spot in the North Atlantic Ocean with their yachts for the occasion, which will continue throughout June. Additionally, Boat International hosted the America's Cup Superyacht Regatta from June 12-15, meaning that a number of the stunning participants are still being photographed across the island. 1. Jetsetter The 38.6 metre superyacht Jetsetter has been spotted a number of times watching the racing in Bermuda since June 10. She is currently located at the heart of the Great Sound alongside Asahi, Rena and Musashi. Delivered last year by Dynamiq, an official supplier of the America's Cup, Jetsetter can sleep up to 10 guests in four cabins and has an interior designed by Bannenberg & Rowell. She is currently for listed sale and was chartered by the ACEA from June 9 until the final race day. 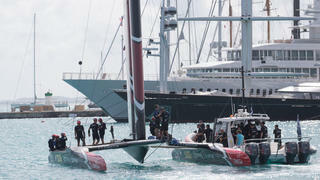 The much-anticipated 35th America's Cup kicked off on May 27 in Bermuda and hundreds of people have flocked to this tiny spot in the North Atlantic Ocean with their yachts for the occasion, which will continue throughout June. Additionally, Boat International hosted the America's Cup Superyacht Regatta from June 12-15, meaning that a number of the stunning participants are still being photographed across the island. 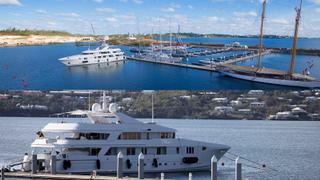 The 38.6 metre superyacht Jetsetter has been spotted a number of times watching the racing in Bermuda since June 10. She is currently located at the heart of the Great Sound alongside Asahi, Rena and Musashi. Delivered last year by Dynamiq, an official supplier of the America's Cup, Jetsetter can sleep up to 10 guests in four cabins and has an interior designed by Bannenberg & Rowell. She is currently for listed sale and was chartered by the ACEA from June 9 until the final race day. After a few months cruising around the Caribbean, making stops in Tortola, St Thomas, Gustavia and a number of other islands, 54 metre Benetti Starfire is now in Bermuda, and will be there for the duration of the America's Cup. Currently, she's anchored in Hamilton, with 56 metreRosehearty, 49.96 metre Jo and 52.36 metre Elfje nearby. Delivered in 1998 and refitted in 2012, her art deco interior can accommodate up to 12 guests in six cabins, which includes a full-beam master suite. 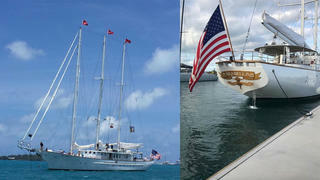 After a few months cruising around the Caribbean, making stops in Tortola, St Thomas, Gustavia and a number of other islands, 54 metre BenettiStarfire is now in Bermuda, and will be there for the duration of the America's Cup. Currently, she's anchored in Hamilton, with 56 metreRosehearty, 49.96 metre Jo and 52.36 metre Elfje nearby. Delivered in 1998 and refitted in 2012, her art deco interior can accommodate up to 12 guests in six cabins, which includes a full-beam master suite. Currently located in Caroline Bay Marina, the 46.94 metre superyacht Rhino is moored alongside the likes of 47.7 metre Arabella, 31 metre Race For Water and 24 metre Aiyana. Delivered in 1998 by Admiral Marine and last refitted in 2015, Rhino will most likely spend the summer months in Bermuda, the Bahamas or New England. Caroline Bay sits within the Little Sound and can host yachts up to 90 metres. Its perfect positioning for viewing all the action of the 35th America's Cup makes it one of the best new marinas to discover around the world. The rest of the Caroline Bay development, which will include a hotel, restaurants, luxury residences and spa, is due for completion in April 2018. Currently located in Caroline Bay Marina, the 46.94 metre superyacht Rhino is moored alongside the likes of 47.7 metre Arabella, 31 metre Race For Water and 24 metre Aiyana. Delivered in 1998 by Admiral Marine and last refitted in 2015, Rhino will most likely spend the summer months in Bermuda, the Bahamas or New England. Caroline Bay sits within the Little Sound and can host yachts up to 90 metres. Its perfect positioning for viewing all the action of the 35th America's Cup makes it one of the best new marinas to discover around the world. The rest of the Caroline Bay development, which will include a hotel, restaurants, luxury residences and spa, is due for completion in April 2018. As Emirates Team New Zealand battled with the windy conditions during yesterday's (6 June) first race against Land Rover BAR, the 50m superyacht Jo got as close as possible to the action. The yacht was spotted on the stormy waters behind the Kiwi Team while she cruised around Great Sound. The second race of the day proved to be even more dramatic for the New Zealand team when their catamaran capsized in the start box. As Emirates Team New Zealand battled with the windy conditions during yesterday's (6 June) first race against Land Rover BAR, the 50m superyacht Jo got as close as possible to the action. The yacht was spotted on the stormy waters behind the Kiwi Team while she cruised around Great Sound. 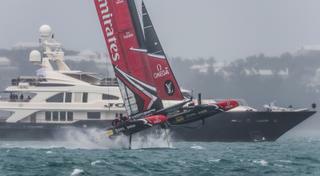 The second race of the day proved to be even more dramatic for the New Zealand team when their catamaran capsized in the start box. 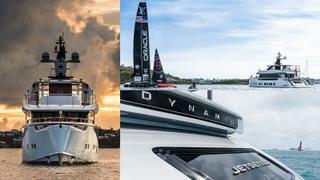 On May 29 a huge number of yachts turned out the watch the third day of racing at the America's Cup. 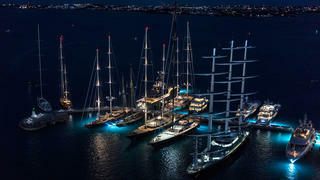 In the top left-hand side of the photo, 43 metre expedition yacht Marcato can just be seen, with 33 metre sloop Leopard 3 in front of her on the far left and 54 metre Starfire to her right, sporting a Union Jack flag. Just behind Starfire is the gargantuan 87 metre Musashi, while to her right sits 44.5 metre motor yacht Balaju and 36.91 metre Genevieve. In the top right-hand side of the photo, 64.41 metre classic yacht Shemara (originally delivered in 1938) is anchored, with 44 metre sloop Visione and 56 metre Rosehearty in front. 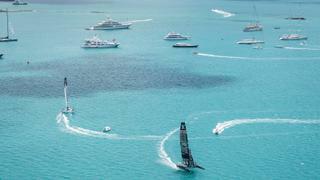 On May 29 a huge number of yachts turned out the watch the third day of racing at the America's Cup. 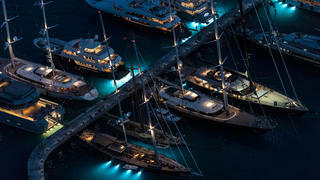 In the top left-hand side of the photo, 43 metre expedition yacht Marcato can just be seen, with 33 metre sloop Leopard 3 in front of her on the far left and 54 metre Starfire to her right, sporting a Union Jack flag. Just behind Starfire is the gargantuan 87 metre Musashi, while to her right sits 44.5 metre motor yacht Balaju and 36.91 metre Genevieve. In the top right-hand side of the photo, 64.41 metre classic yacht Shemara (originally delivered in 1938) is anchored, with 44 metre sloop Visione and 56 metre Rosehearty in front. As the teams readied themselves for day one qualifiers on May 26, the bows of Musashi and Maltese Falcon are visible behind the action. Currently, she is anchored at the heart of the Great Sound. Maltese Falcon is currently moored at the King's Wharf. Musashi was spotted cruising in the Mediterranean earlier this year. As the teams readied themselves for day one qualifiers on May 26, the bows of Musashi and Maltese Falcon are visible behind the action. Currently, she is anchored at the heart of the Great Sound. Maltese Falcon is currently moored at the King's Wharf. Musashi was spotted cruising in the Mediterranean earlier this year. 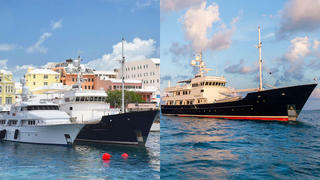 A huge variety of yachts were photographed on May 27 moored along the King's Wharf. From right to left, 39 metre H, 47.85 metre Never Enough and 39.24 metre Safira, the 56 metre sailing yacht Rosehearty and the stern of 70.71 metre Skat is just visible. On the other side of the pier, you can just see the stern of 52 metre Latitude, the stern of 88 metre Maltese Falcon, then 60 metre Perseus^3, 56 metre Asahi and 51.59 metre Meteor. A huge variety of yachts were photographed on May 27 moored along the King's Wharf. From right to left, 39 metre H, 47.85 metre Never Enough and 39.24 metre Safira, the 56 metre sailing yacht Rosehearty and the stern of 70.71 metre Skat is just visible. On the other side of the pier, you can just see the stern of 52 metre Latitude, the stern of 88 metre Maltese Falcon, then 60 metre Perseus^3, 56 metre Asahi and 51.59 metre Meteor. Another photograph from May 27, the same fleet can be seen, with the addition of two sailing yachts at the end of the jetty to the left of Meteor – 39.75 metre Huckleberry and 44.84 metre Visione, who has since cruised around to Hamilton. Classic sailing yacht Arabella was spotted on May 19 moored in the Caroline Bay Marina. Delivered by Palmer Johnson in 1983, she was completely rebuilt in 2000 and spent this past winter cruising around the British Virgin Islands. Classic sailing yacht Arabella was spotted on May 19 moored in the Caroline Bay Marina. Delivered by Palmer Johnson in 1983, she was completely rebuilt in 2000 and spent this past winter cruising around the British Virgin Islands. The 31 metre eco trimaran Race For Water was spotted on May 29 moored in St George's in Bermuda, where she arrived on May 22. Currently, she is moored in the Little Sound. Delivered in 2010 by Knierim YachtBau, the pioneering yacht is currently on a solar-powered circumnavigation tour– she will also by stopping off in Tokyo for the 2020 Olympic Games. 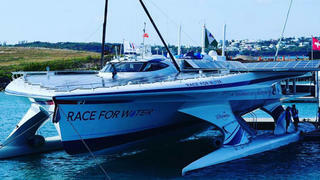 The 31 metre eco trimaran Race For Water was spotted on May 29 moored in St George's in Bermuda, where she arrived on May 22. Currently, she is moored in the Little Sound. Delivered in 2010 by Knierim YachtBau, the pioneering yacht is currently on a solar-powered circumnavigation tour– she will also by stopping off in Tokyo for the 2020 Olympic Games. Palmer Johnson superyacht 46.48 metre Pioneer is currently moored up alongside 44.2 metre Rena in Hamilton, having spent winter in the Caribbean. Custom-built for exploration, Pioneer was delivered in 1996 and will be cruising in Greenlands and the Northwest Passage later this summer. Palmer Johnson superyacht 46.48 metre Pioneer is currently moored up alongside 44.2 metre Rena in Hamilton, having spent winter in the Caribbean. Custom-built for exploration, Pioneer was delivered in 1996 and will be cruising in Greenlands and the Northwest Passage later this summer.